The robots from the award-winning StoryBots apps, videos, and Netflix show present a new early reader about one of the coolest dinosaurs! Its distinctive horns and gigantic neck frill make Triceratops one of the most recognizable and popular dinosaurs. This Step 1 rhyming Science Reader will entertain while sharing some basic facts about this heavy-weight herbivore. 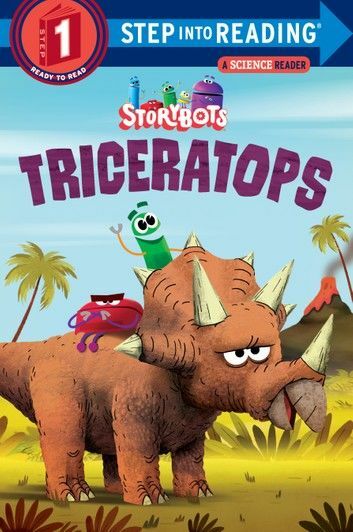 Children will recognize the signature catchy--and hilarious--rhymes and colorful art from the StoryBots popular YouTube video "Triceratops." Step 1 Readers feature big type and easy words for children who know the alphabet and are eager to begin reading. Rhyming text is paired with picture clues to help children decode the story.